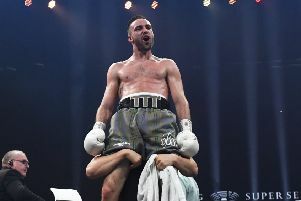 Edinburgh boxer Josh Taylor made it six professional wins out of six at the Barclays Center in Brooklyn, New York, on Saturday night with another devastating display against American Evincii Dixon. The 2014 Commonwealth Games gold medallist was a cut above his opponent from the first bell, leading with the jab before landing a punishing left shot towards the end of the second round that left the Pennsylvania native flat out on his back. Despite retreating to his corner to recuperate, the American failed to return for the start of the third round, giving Taylor his sixth consecutive knockout since switching to the paid ranks last July. The 25-year-old Scot, who is managed by Cyclone promoter and former WBA featherweight champion Barry McGuigan, is yet to be taken beyond the second round by any opponent and is now certain to be stepped up a level in the coming months. Taylor was fighting on the undercard of his Cyclone stablemate Carl Frampton, who claimed the WBA featherweight belt by outclassing holder Leo Santa Cruz to win a majority verdict. “I don’t know if it’s sunk in yet ... that’s going to be a fight that defines part of my career,” he said.